It all begins here! Director-star Jackie Chan's celebrated Police Story series began with this classic action comedy, which features the inimitable Jackie Chan charm and some of the most spectacular action sequences ever put to film. Jackie Chan is cop Chan Ka Kui, who's assigned to guard beautiful witness Selina (Brigitte Lin), the girlfriend of evil drug kingpin Chor Yuen. Selina's presence causes some friction between Chan and his petulant girlfriend May (international star Maggie Cheung), but when the bad guys come-a-calling, all that gets left behind. 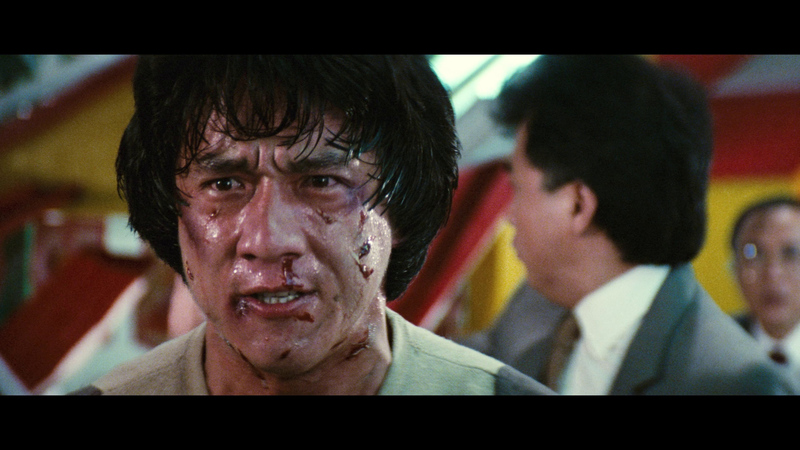 Glass breaks, bones crunch, and anything and everything becomes a weapon in Police Story! A seminal film even in Jackie Chan's incredibly action-packed filmography, Police Story redefined action films with its undeniably creative and exquisitely choreographed mayhem. Unbelievable stunts and breathtaking set-pieces set the tone in this award-winning film, which earned a Best Picture award at the 5th Annual Hong Kong Film Awards. 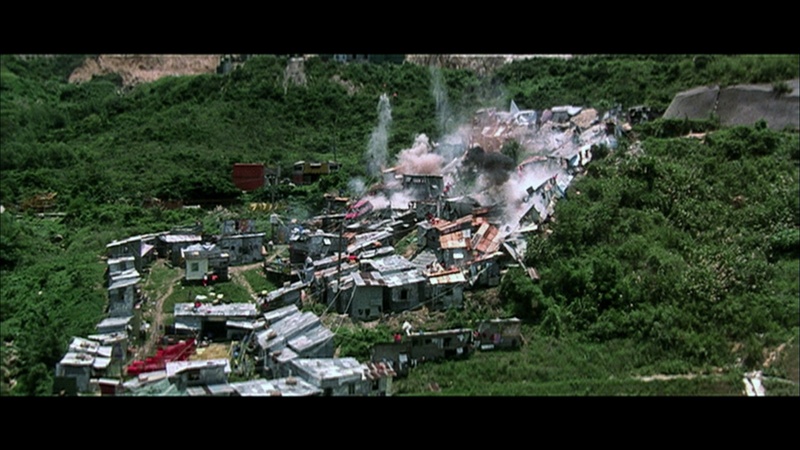 Action to watch for includes an amazing car chase through a hillside shantytown, a stunt-filled chase with Jackie Chan hanging onto a bus with only an umbrella, and a simply mind-blowing finale in a shopping center, which could qualify as a world record for collateral damage via punches, kicks, or people simply falling through glass. 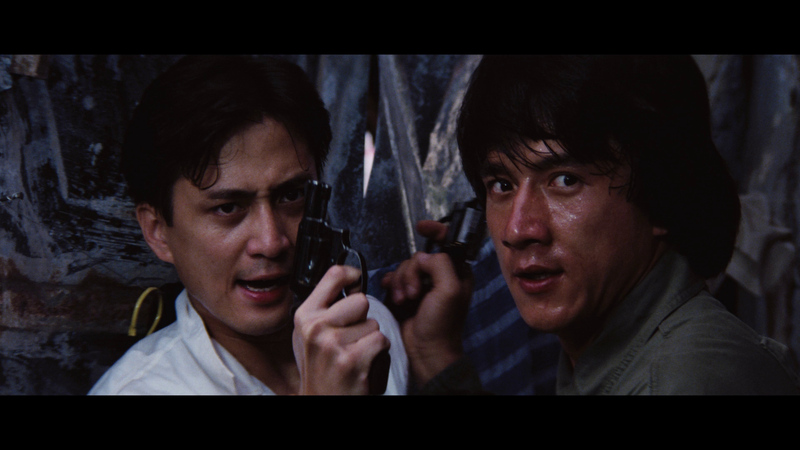 All the above, plus Jackie Chan's generous comic persona, are present and accounted for in Police Story! 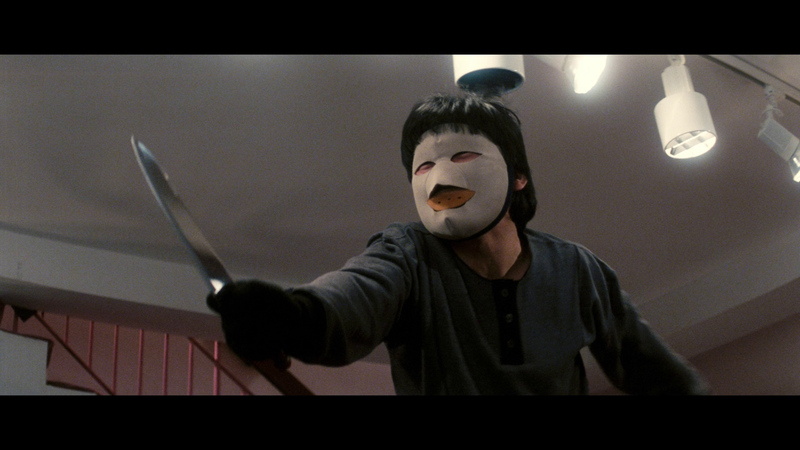 The Film: 7 NOTE: The below Blu-ray captures were obtained directly from the Blu-ray disc. 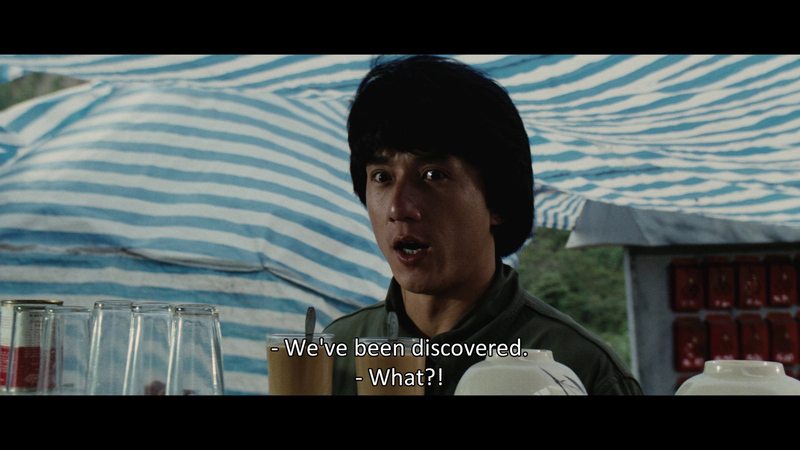 Jackie Chan’s Police Story must have really taken its audience by surprise. 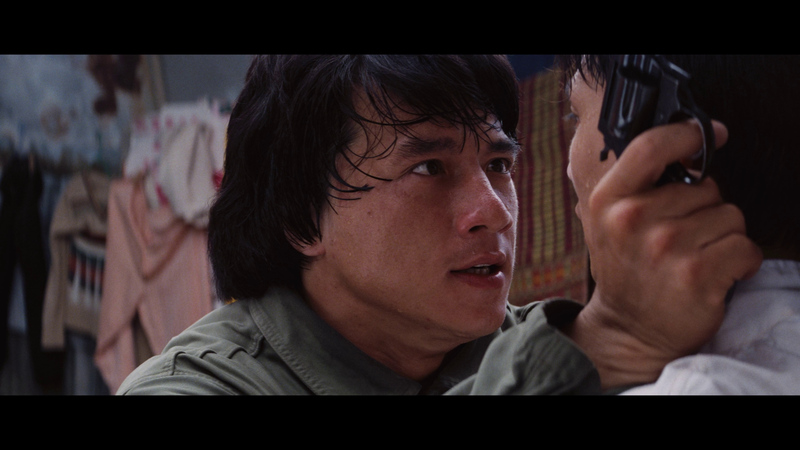 It mixes low comedy with suspense and thrilling action scenes. There’s even an attempt to give characters some dimension – some. 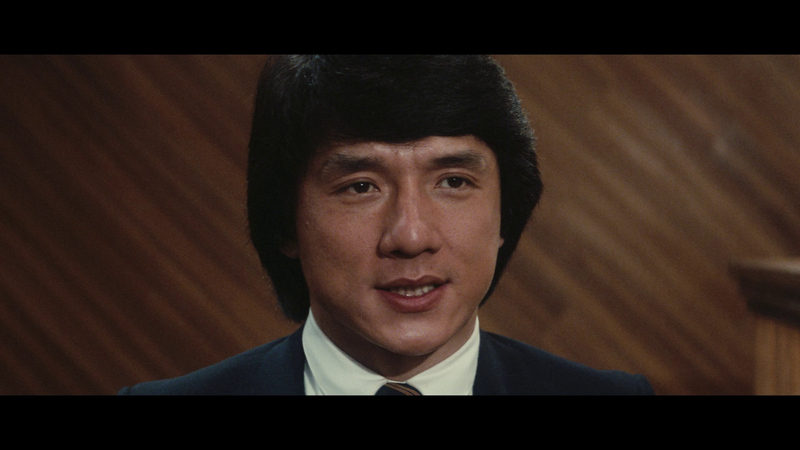 But it’s Jackie Chan’s bonecrunching stuntwork that boggles the mind. For a nice guy who isn’t obviously psychotic he certainly places himself in astonishing amounts of harm’s way – and these are just the shots that made it to film – what about all the stuff that required a second take! Determination, combined with skill, talent and a carefully crafted sweet persona – an unbeatable combination. Seen from a perspective twenty years later, Police Story does not rise to the level of effort that Jackie Chan put into it. In other words, the whole is actually less than the sum of its parts – but, oh, what parts! 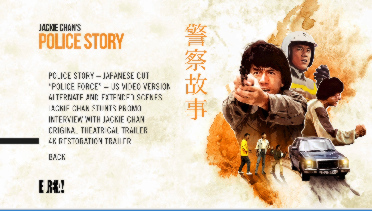 Fortune Star released a freshly remastered Police Story Trilogy for DVD in 2004. It arrived in a smartly crafted box, with each movie housed in its own sleeve plus a nice photo album – the sort of care and expense we see precious little of on Blu-ray from any studio. Compared to what preceded it, the remastered version was a knockout. It still had contrast issues and its share of source element deterioration and edge enhancement, but aside from these, it looked and sounded about as good as I thought we were going to get. 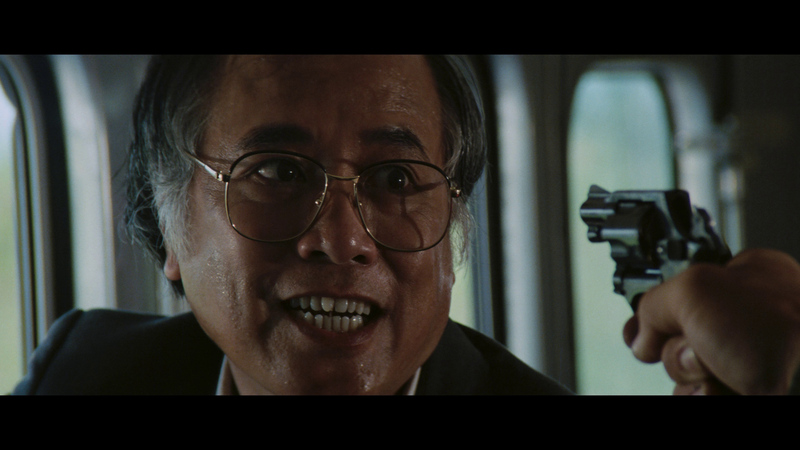 Enter Fortune Star’s Blu-ray and – whoops. Even a casual examination of the comparative caps indicates that the usual improvement in sharpness is not there. Far from it. And if the DVD was too yellow, the Blu-ray is too red. 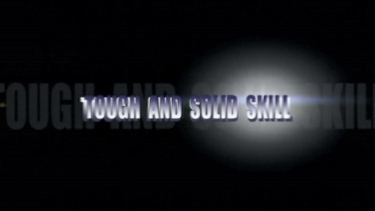 Yes, the tendency for the DVD to appear polished, smoothed out and a little brightened is clear (we probably didn't used to think so, but the Blu-ray does make this evident), but grain, bordering on noise, begins to dominate – very likely because the Blu-ray is a more accurate reflection of the source elements. But, then, what about the loss of sharpness, suggesting the source is severely compromised, whatever it is? There is also a curious horizontal compression of the image at the sides, where figures tend to narrow, reminiscent of the earliest days of CinemaScope and later video renderings. 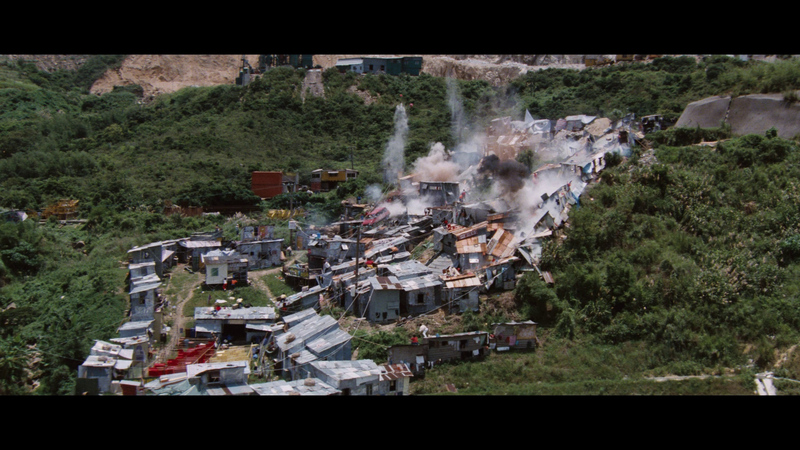 Worse still is that the dizzying effect this produces when the camera pans in either direction. Dramamine is advised. I'll be brief. 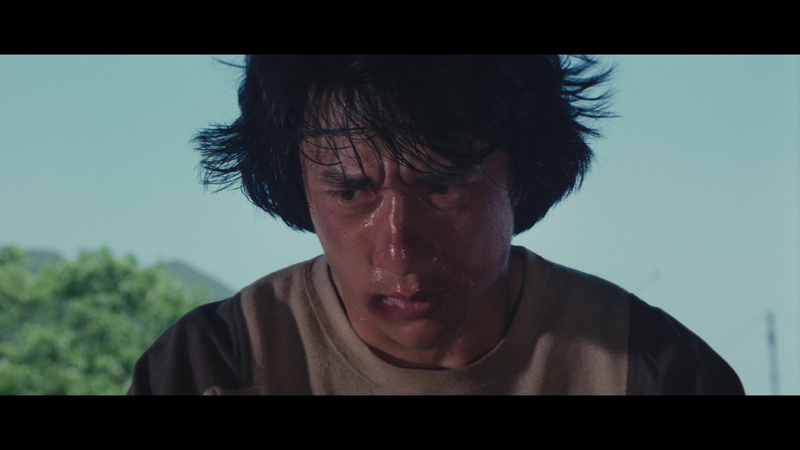 This new Eureka 4K-restoration is what fans of these first two Police Story films have been waiting for. It leaves no stone unturned with every conceivable audio and DUB option, plus alternate versions (Japanese and US cuts) of the films and other extras. Everything is more technically robust and although the presentation is imperfect with some inconsistency - it's a gigantic leap beyond the original, warped and overly bright, Blu-ray transfer. 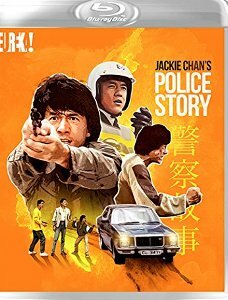 NOTE: This review was delayed as it is for the corrected version - the original Eureka release had drop-outs throughout for Police Story - the first one occurring at the 10-minute mark. Eureka is offering a replacement program for affected discs - email customer@eurekavideo.co.uk. There's just so much massaging you can do with a mono or simple stereo track in order to create a surround field of convincing proportions. 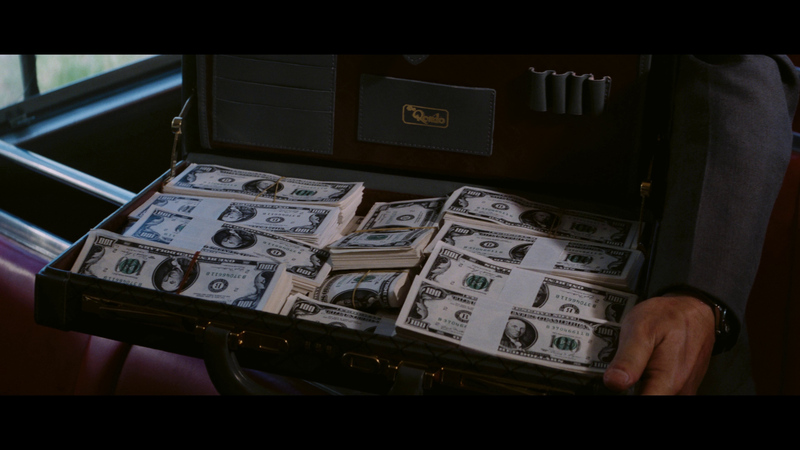 MGM/Fox was hit and miss with the early Bond films on Blu-ray, but Disney seems to have gotten it right for Pinocchio. 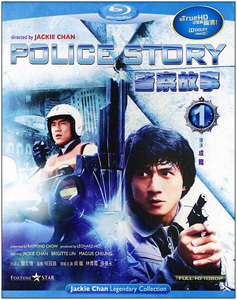 Fortune Star has been messing around with the audio for Police Story for some while, but had the good sense to offer the original Cantonese 2.0 along with a DTS and a 5.1 Dolby on their remastered DVD, but on their Blu-ray, we must suffer with a Dolby TrueHD 7.1, as if this settles the matter. The Mandarin uncompressed mix and Thai Dolby EX 6.1 are even less good (as expected since they are dubs.) But, alas, there is no original track at all. Not that the original was any great shakes, but neither did it have pretensions. 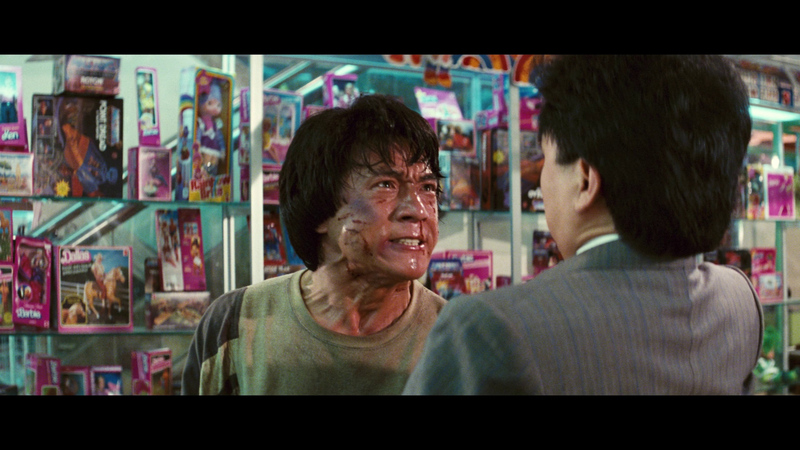 So what we are left with on the Blu-ray is the Hong Kong old school sock 'em chock 'em effects where no sound is believable, save perhaps the dialogue, and even that, though clear, is pressured. Effects sound as if they have been squeezed through a tunnel, and then given a treble boost after the horse has left the barn. 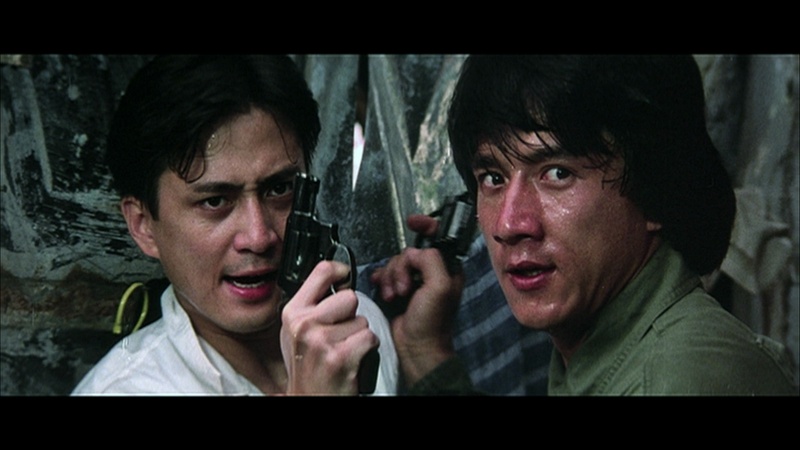 Four options - the original Cantonese Mono audio track; Restored Cantonese 5.1 (24-bit - twice as robust as the Fortune Star; Restored English 5.1 dub track (also 24-bit) AND an additional audio track featuring an alternate English dub sourced from a rare Dutch VHS release of Police Story that has never been officially released on any other version of the film. 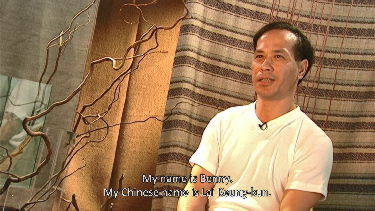 All superior and optional English subtitles. The package is Region 'B'-locked Blu-ray. In addition to a stills gallery the Blu-ray includes "NG shots" – a collection of production footage of stunts and outtakes. 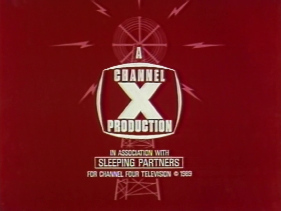 Even the DVD had trailers. Extras include The Japanese Cut (1:45:13 - HD) originally released exclusively to Japanese home video, this extended cut of the film was transferred to HD from a film print in 2012 and makes its UK debut here with it's original Cantonese audio and English subtitles for the first time ever plus Police Story: The Police Force Cut (1:28:01- SD) - a unique version of the film edited exclusively for the American home video market, featuring a unique dub track and electronic score. 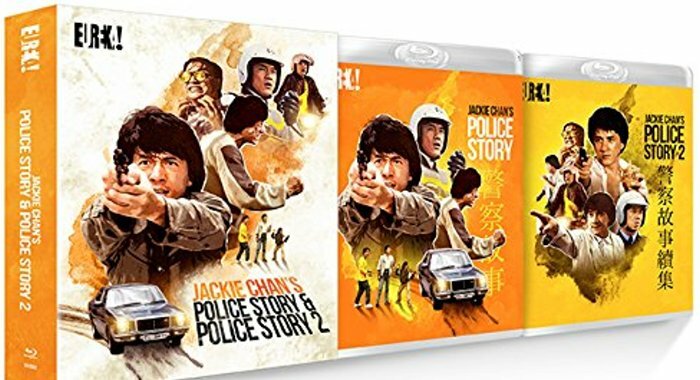 There are Police Story Alternate and Deleted Scenes, including alternate opening and ending sequences, an archival, 20-minute, interview with Jackie Chan, a "Jackie Chan Stunts" Promotional trailer plus film trailers (2:47, 4K-restored 3:13) and the package has a collector's booklet feat new writing on the film & rare archival material plus a second Blu-ray of Police Story 2 with its own extras. Wow. While the Blu-ray may be more filmic in presentation, it's not much fun to look at. But unless someone starts from a different source, this is about as good as we're likely to get. BTW, YesAsia indicates it still offers Fortune Star's region-free remastered Trilogy HERE. 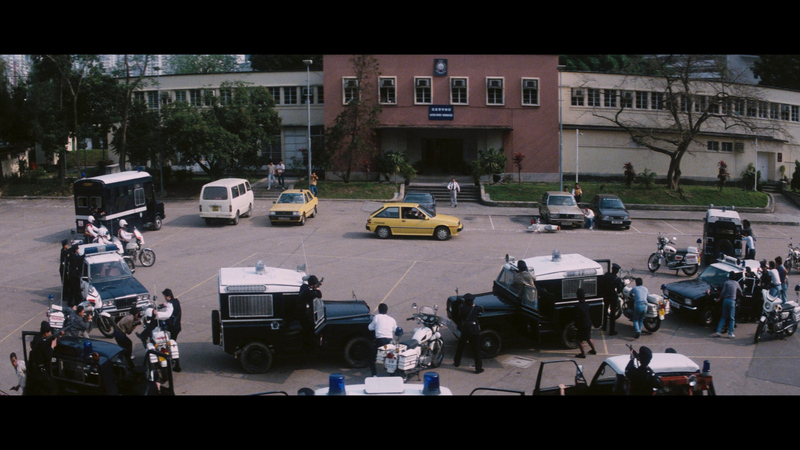 The Eureka is easily the one to own - 4K restored, stacked with alternate versions plus a second Blu-ray of Police Story 2. Super action and fun... sold!